Scuzz Model: Is this it? Nope… is this it? Nope…. I spent a lot of time watching and analyzing the offense from Week 1 and came away thinking this team could still score and had progressed relative to last year in their scheme, attacking the middle of the field, more variety, etc. I wrote in this space that the Fitz Formula – strong D, and effective O – has worked as recently as 2012, and this offense was not too far away from putting it all together and getting back to winning close games. Then Trevor pulled the deep ball out of his pocket this weekend, and threw for 4 sweet TDs that went for more than 20 yards, plus made a number of other great throws in tough spots (3rd and 19, etc) to really bail NU out of trouble. Wait… one of those TDs was picked off when the CB made an absurd athletic play (and committed pass interference?) No problem, we still were up 21-10 going into the 4th quarter… wait, the prettiest ball Trevor has thrown in a purple uniform was dropped at the goal line? Yikes. And the 3rd TD was lost in the sun by our superfast flex RB/WR after he (for the 2nd week in a row) zipped by his 1-on-1 defender on the outside? And a bunch of other good plays were called back for holding? This team seems so damn close, but feels miles away. You line up all the near misses over the past 6 years (the entirety of the McCall OC era), and it’s long enough to fuel a tragic HBO series. We fix one problem (Trevor’s accuracy), have the breakout game from Prater we’ve all been waiting for, and six other things go south. I regret not being able to cite who tweeted this on Saturday, but the comment that NU’s offense “feels like trial and error” was apt. Trial and error can work when it involves creativity and catching teams off balance. It does not work when your football philosophy is winning the field position battle. You have to have an identity and a plan, and ours seems to change with the wind, for instance shifting inexplicably to a power set on 2nd down after carving up a team from the spread. This is not intended to be an excuse article. Fitz’s career began with better than realistic results in close games. Now he is mired in the opposite situation. 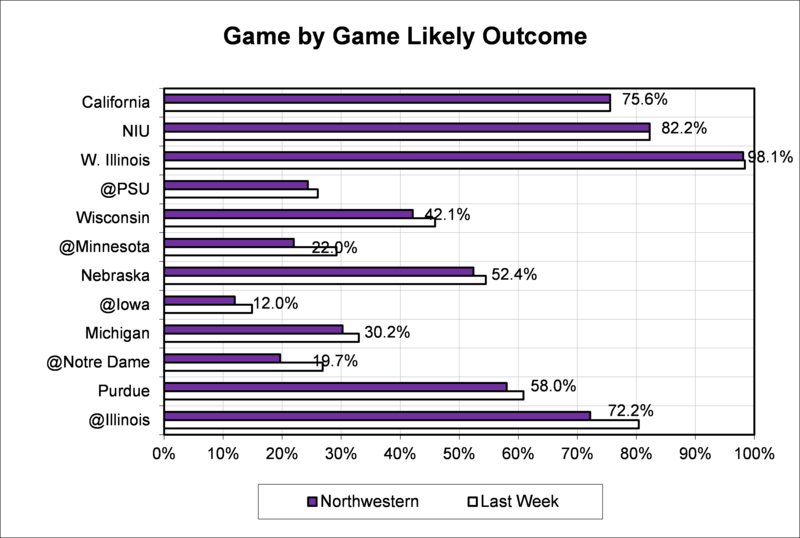 It seems very plausible for the coaches to look at these games and say “we are 2 plays away”*, devise a way to drill those plays all week in practice, only to have something else get tripped up on game day. I stand by my comments last week that our offensive output is not far off from what it’s been in the past (Kafka, Bacher, etc.) But perhaps the difference in game outcomes is that the world around our offense has changed. The reality is that College Football as a whole is drastically different from 2006, and has become less risk-adverse and more dynamic. This coaching staff seems to be moving in the opposite direction, stubbornly emphasizing their approach and how close they are to breaking through (this problem is not ours alone – go watch Stanford’s recent abysmal games vs MSU and USC.) 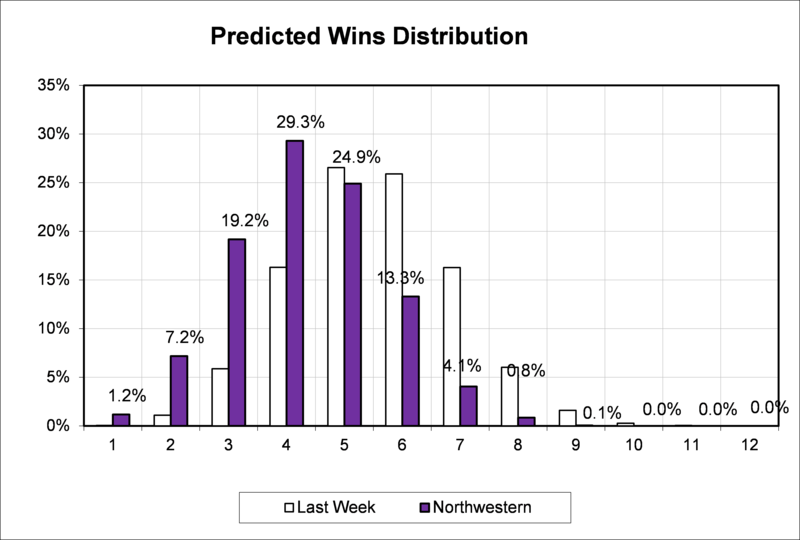 These are dark days for NU football fans, and there are no easy answers. I believe that Fitz needs to adapt his approach in some way to re-establish the Cats’ margin for execution error. Only then can we break out of this funk. *I’ve said this almost every week for as long as I’ve been a Cats fan. Tennessee (+21) @ Oklahoma: The Volunteers looked like a much improved team in destroying a solid Utah State team in week 1, and now travel to Norman for a massive game. I like the them to barely cover this spread – Oklahoma is really good, but UT is young, fast, and matches up well. Model favors the Sooners by just over 2 TDs. Toledo (+12) @ Cincinnati: This is absolutely a game Cincinnati should win, but here are the facts: Toledo is good. They return 16 starters. They gave Missouri a game last year and beat Navy. Also, you know how lots of CFB teams looks sloppy week 1? Well the Bearcats are playing their first game of the season this week, while Toledo is on week 3. The model only favors Cinci by 1, and that’s without any adjustment for rust. UTSA (+16) vs Oklahoma State: The model loved the newly-FBS-minted UTSA Road Runners last year, and they didn’t disappoint, covering against Arizona and Oklahoma State in the early going. They ran out of gas in the 2nd half, but are so senior laden and experienced this year they almost knocked off Arizona, and demolished another experienced team in Houston. Ok State showed they are better than advertised week one, but I still like UTSA to give them a run in the game, especially having played them last year. Model has Pokes by 5. Nebraska (-10) @ Fresno: Fresno State looks to be in a different universe without Derek Carr this year, getting annihilated two weeks in a row. One of the things they couldn’t do against USC was tackle well in the open field. Well, Ameer Abdullah is coming to town, and I think it’ll be a rout. Everyone is down on Nebraska for almost losing last week, and rightfully so, but I have a feeling McNeese would crush Fresno too. Model favors the Huskers by 19. Nevada (+14.5) @ Arizona: After a close game against UTSA last week, Arizona surely won’t be overlooking the Wolfpack this week. I think they will ultimately win the game, but Nevada has a really strong, veteran team and I like their defense’s ability to keep it somewhat close after shutting down Connor Halliday last week. Model likes AZ by a TD. The Midwest is reeling as the worst day of Big Ten football since Jan 1, 2012 has essentially eliminated the conference from the playoff chase! I think there is still some semblance of a chance, but it would require a 13-0 season and probably some luck on the part of PSU, Nebraska, or Iowa. Here’s why… Marshall is a fun blip to talk about crashing the first playoff party, but BYU is a legit threat. Go look at their schedule… it is not difficult to see them 12-0 at the end of the year, and with a 34 point demolition of Texas (in Austin) on their resume already… would they be excluded for a unimpressive 11-1 Badger team? In addition, Notre Dame looks like they are for real again with Everett Golson, and could conceivably reach 11 wins, which given their schedule would have them in the conversation as well. Add in your guaranteed SEC champ, Florida State, and an uninjured-as-of-yet Oregon team…. And you have a recipe for major controversy in the first year of the playoff. Oh joy!! Here is the hope for the Big Ten… The Pac 12, Big 12, and ACC only have one dominant team each, with few legit challengers. Texas and UCLA which were supposed to be resurgent this year instead play one another this week in the Shredded Wheat Who-Actually-Wants-to-Win-a-Big-Game Bowl. Oklahoma is still the presumed B12 power, but don’t tell me OSU can’t beat them. I am also not ready to believe in Baylor. USC looks interesting, but is too thin to turn what they did to Stanford last Saturday into a championship run. Speaking of the Cardinal, they are playing more conservative than Northwestern on offense, although they’ll probably still beat Oregon (and injure Mariota) and destroy the the Pac 12’s chances. Finally, FSU should romp its way through the ACC, but has a (very recent) history of effing up in games they should win easily – plus, repeating is hard (see: Alabama 2013 & 2010). Could the playoff really boil down to 2 SEC teams, Notre Dame, and BYU? Crazier things have happened. Posted on September 11, 2014, in Saturday Morning Stats. Bookmark the permalink. Leave a comment.